Decorating a student room in a halls of residence is always tricky. This time last year, my son started his first year at university and what made things even more complicated was that he was studying music and had guitars, keyboards, microphones and recording materials to arrange in this small space. Students spend a lot of their time in this space where you can find a haven of peace free of stress and hopefully where you can study. 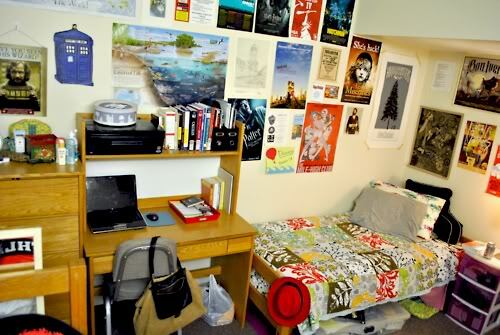 Decorating your room can be a discouraging task but it can also be fun just like your first year at uni. 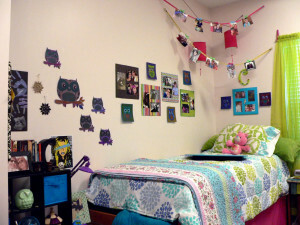 Here are a few tips that will help you make your room your own for a year. It’s nice to cover the bed with a throw as often the bed is also used as a sofa, where food and drink are consumed. It is important to choose a throw which shows your character but does not show dirt! Once you have chosen the throw, it will help you determine the colour scheme of the room. Romantic pastel tones, bright ethnic colours or black and white? You can also get a reversible bed cover, that way you won’t get too bored of looking at the same colour all year! You can then add a few cushions and a matching rug you can place in the middle of your room. Very trendy, it is so much nicer to put your foot down in the winter morning on a fluffy carpet than a tiled floor. The trend at the moment is for shaggy rugs, however if you think that it will look like dreadlocks after some beer spillage, you better choose a low-pile carpet. And as we know, a student room is not very big, but just adding a few mirrors will give the illusion of space. 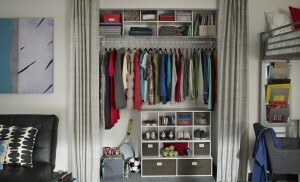 Plastic boxes can be placed under your bed and your wardrobe for extra storage. A few extra hooks place on the back of the door can be a good investment. Under bed storage bags are also a good idea. Using bed risers will increase your storage place so that you can store more boxes and suitcases. Adding a few shelving unit are the best thing which can be added to your space so that you can tidy up your books and CD/DVD. The advantage of the small shelf is that it can have various functions. 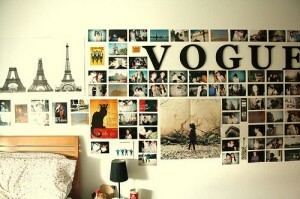 Once you have the basics, you can start decorating your room. It’s a good idea to check the rules whether you are allowed to make holes in the walls…before starting. Obviously, posters are the best way to decorate your wall, some uni organise posters sales at the beginning of the year where you will be able to find some unusual pictures. Using a washing line, you can hang some pictures of your loved ones. 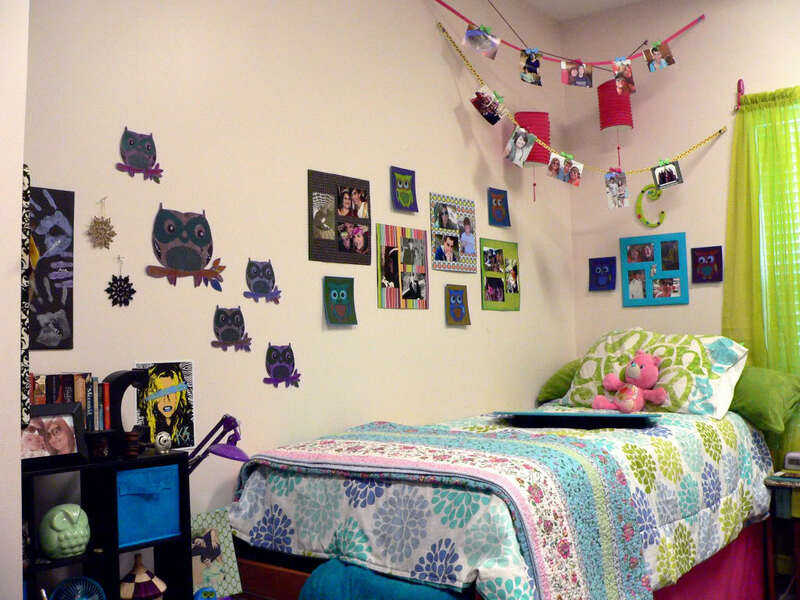 How about getting a white board where you can write messages, notes, reminders… Mural stickers are very trendy! Another nice idea is to stick a text in large font on the wall. Invent a slogan and stick it on the wall of your bedroom! Recycle old vinyls and fix them to the wall. Have various sources of light placed randomly in the room. A nice trendy desk lamp will finish the look and how about hanging lights around the room? 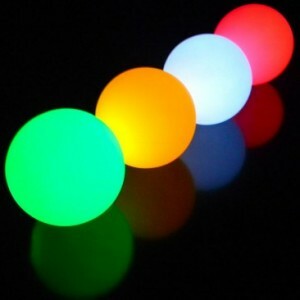 I love small balls of lights which have different colours at slow intervals. Avoid halogens which makes space look smaller. Place a lamp on the ground, then one placed at middle height and finish by a standard lamp on a cupboard. In most student residence accommodation, candles or incense sticks are not allowed for safety reasons, it’s always a good idea to bring some reed diffusers instead. And to add a bit of nature, why not place a few potted plants around your room? A few house plants will add some colour to your small living space and just like trees, plants purify the air which you breathe. In confined spaces, the air can be charged with many unknown toxins from the paint, the carpets or even from the furniture. While placing a plant on a shelf or near a window, you can improve unconsciously (or rather consciously now…) your health and your abilities to give the best of yourself. 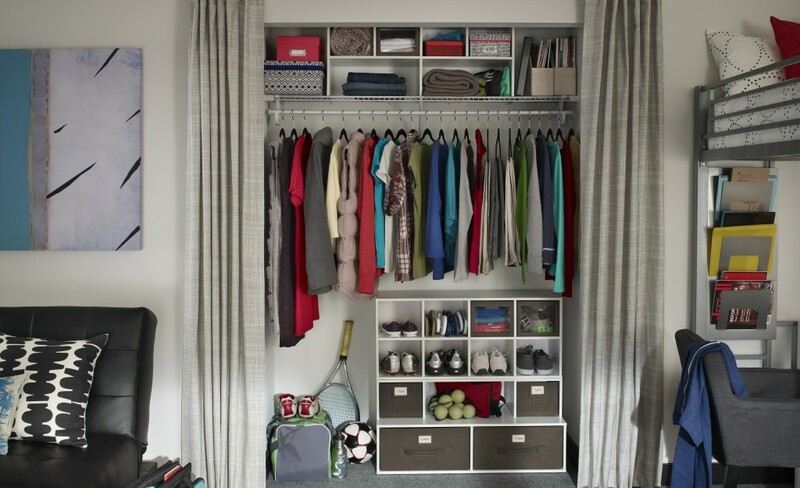 Make sure your room is well organized and tidy; believe me it will save you time. I hope these ideas will spice up your room and that you will enjoy decorating it. Please let us know if you have any other tips. This article was posted in Painting and decorating. Bookmark the permalink. Follow comments with the RSS feed for this post.Post a Comment or leave a trackback: Trackback URL.